The Resonate Membership Plan offers students an opportunity to devote themselves to learning music within a consistent yet flexible schedule. We understand that continuous musical involvement best promotes progress and that being constrained to enrollment in disjointed terms can slow a student’s learning process. This Plan eliminates the amount of time lost re-familiarizing students with material forgotten over lengthy breaks between terms, allowing for efficient and accelerated learning and in turn maximizing the value of their lessons. 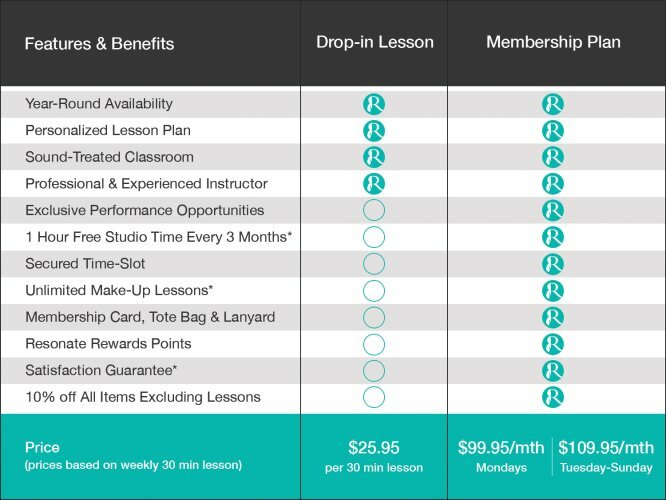 The Resonate Membership Plan is the first of it’s kind in the music education industry and is only offered and protected through Resonate Music School & Studio. Members are provided with a complimentary hour of time in the Resonate Recording Studio every three months! This means they have the opportunity to learn some of their favorite music from a certified Resonate Instructor, record it with our engineer and producer, and have their recordings made into their own CD to share with friends and family. At Resonate we understand the value of a lesson time slot that fits well in to a busy schedule. Our Members are guaranteed the time slot they have selected for as long as they wish to use it. Of course, we are also aware that personal schedules may change, and our Members are welcome to choose a different available lesson time at any point without having to worry about paying a transfer fee. Our Members have the flexibility of making up lessons they are unable to attend if they give even twelve hours of notice. This means that whether it’s an illness or a family vacation, there’s no reason for a missed lesson to become a lost lesson. Each and every new Resonate Member receives a Welcome Package that includes a Folder, and Tote Bag. Resonate Rewards Points are earned by students on a lesson-by-lesson basis and can be redeemed for various items ranging from merchandise and equipment to gift cards and entertainment passes. In their Rewards Points Journal, students can track how many Points they’ve accumulated, add items to their wish list, and record which ones they have successfully collected. 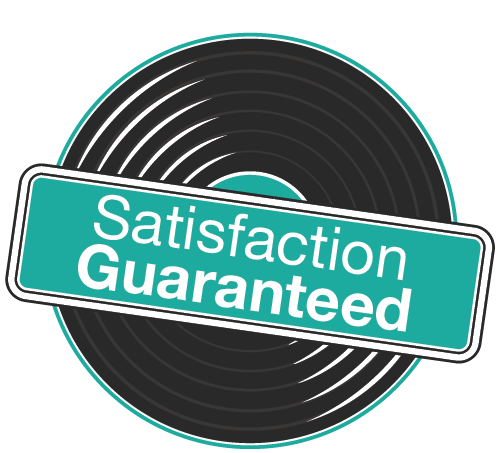 The first and only music school in the region with a Satisfaction Guarantee to assure students that we are accountable and give them the opportunity to try us out risk-free. An exclusive feature to the Resonate Membership Plan.